Brush crematoria soot from a tear stained cheek. it can not be erased from the depths of my mind. Singing hopeful prayers they refused to face away. kept the furnaces burning all night long. Not fast enough to clear the piles of decay. Ripped them apart nowhere to hide. Their fortitude, their pain and despair. the shooting wall… just like me. 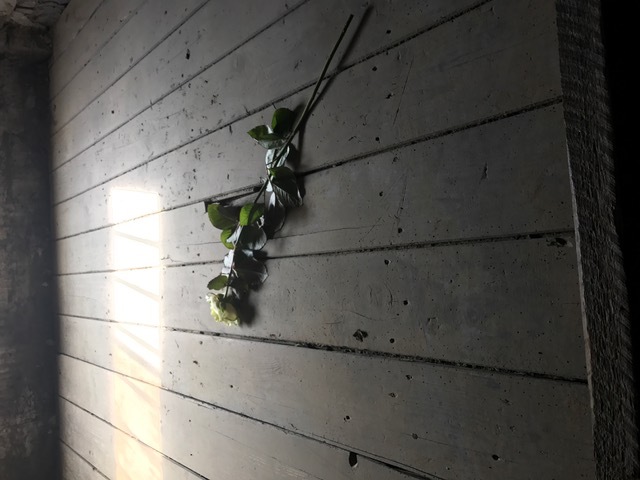 The rose was placed on one of the beds that held six bodies in the barracks of Auschwitz one. Poignantly positioned, by someone paying respects on March the second 2017. A piece of me shifted that day, my eyes clouded and my heart cried. I thought long and hard before posting this and though I hope you leave me a comment I will umderstand if you don’t. Next PostA Short Stream Of Consciousness. I don’t think I could ever go there. My brother and daughter have been and like you Ellen, they will never forget it. It’s a very sad poem, although everything about that place is sad! But beautifully written Ellen. Your emotions pour out of it. I’ve never been there and experienced it but your poem was well written. It has made me feel sad and thoughtful, very powerful Ellen. Yes I’m sure it does..
My heart breaks. As a history teacher, no matter how desensitized students are these days, this piece of the past always creates a sombre and pained atmosphere in the room. I have been to Terezin. I still haven’t blogged about it- I often try. A wonderful post about an exceptionally painful place. I vividly remember visiting Auschwitz, especially the gas chambers disguised as shower blocks. My reaction was very similar to yours, and your poem expresses it perfectly. A very powerful piece. Dear George, even for me, re reading my own words … makes the hair stand on my forearms and up my neck. I do not want the humananity in me to evaporate, I want never to forget ; it keeps us from becoming like those that commit such atrocious acts. Thank you for commenting it means a lot. Oh, Ellen. This is a stunning post. And it’s rekindled my desire to visit some of these camps. For the past few years I’ve been reading mostly holocaust memoirs, thinking it’s the least we can do — hear their stories. It’s always humbling to be reminded just how inhuman our species can become. Thank you. This is heart wrenching, Ellen. Yes, I agree. I am listening to the audio book of Dark Visions. Very good to date. Oh wow, I have yet to listen to it. As was Auschwitz😞 and it needs to be remembered even more in today’s selfish world.😟 thank you for taking time to read Roberta. Heartbreaking and impossible to fathom. Well worded. Their stories must be told. I am pleased you came and liked the way I wrote this. One of the hardest visits I have undertaken; one of the hardest to put into words. I have read a lot about Auschwitz but never visited. Now, your powerful words make me feel like I stood there beside you absorbing the horrors. *nods head* my heart still cries and the memory haunted me until I found the words to express it. Thank you for reading. I love that you felt my words were fitting. And sad for all the loss. And thank you for coming. I still can’t comprehend thee power of a small group of evil men. So poignantly written Ellen it must have been very hard to write…I haven’t been but my daughter has and like you she was saddened and shocked to the core..she said you could still feel the evil. It makes you ashamed of the human some of these acts and we should never forget. I also wonder that at times Ellen…When I watch films of times past the level of violence is appalling against our fellow man…Hanging, drawing and quartering is my example… The conclusion …man is cruel to its fellow man and it still continues today… It seems man has learnt nothing or has learnt that cruelty begets their chosen result…. It is time for the world to remember there is but one race … the human race. Ellen, I can hear the truth and sorrow in your powerful prose. 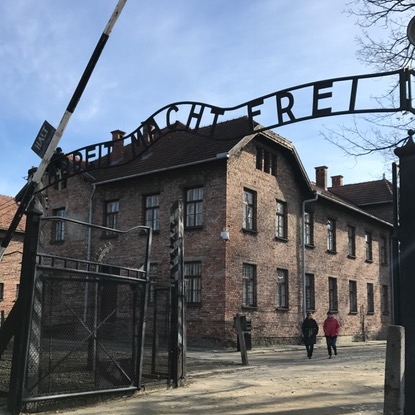 I’ve never been to Auschwitz and while I’ve heard countless stories told to remind us of the cruelty we can never tolerate to repeat, this piece was visceral. Very well-written without lapsing into the maudlin. Will remain with me for a long time. Thank you, it was juxterposed by the beautiful town, the salt mines that had salt cut crystals in giant chandeliers. Sculptures bigger than any man and pools as green as emeralds. Krakoa has lots more to offer than hate. We must find a way to keep this current and in the fore. Only preservation of such terrible recollections of attrocities can stop it happening again. Absolutely, Ellen, I couldn’t agree more. Nicely written on such a grim and sordid tale of the part of history which we all will dread to get repeated again…..will wish that such an era never returns ever…. The only way is to educate and be the best humans we can be. Thank you for reading. I don’t think I will ever be able to visit Auschwitz and see the horror inflicted on mankind! Inhuman..actually! No i can understand it was not an easy thing to do. Thank you for reading. That is what I hoped. Thank you. This is truly touching… you’ve done a beautiful job Ellen of covering an ugly subject that we should never forget or ever want to repeat . You really hit the nail on the head … that rose at the end.. I cried when I saw it, my fae was wet the whole day and often is when I stop to think. You captured my emotional response to walking through Auschwitz/Birkenau perfectly with those lines. Your poem is breath-taking, raw, haunting, and a gift. Thank you for coming, understanding and commenting. Such a difficult experience to convey, yet your poem and reflection probes deeply at the confrontation of the worst in humanity. Turning away is to deny. And that’s why we keep saying we can never forget. Yes, we must not diminish the facts, there is power in keeping atrocities in the forefront; verified by history. Maybe to tweak the consciences of the rulers of many regimes. This tugged at my heart. It’s very beautifully written. There lies the dilemma , as the author you want it loved , to be a good piece of work, it lifts me to know you think it beautifully written. But the subject, you want it to stab the reader, make them hate the barbarity of it. I think/hope I captured both. Thank you for your lovely comments. Yes you did it. Delivered it right in. Right were it hurts. Thank you for coming though i didn’t see a caf’e i must have been blind to the now and lost in the then. You would somehow want there to be nothing nice in its vicinity. My heart aches for those that endured that. It saddens me deep to my core. I don’t know that I could ever visit, as an empath I have a hard enough time watching the news. Going to such a place would probably be too much to bare. I will honor their memory by living a kind and compassionate life, standing up for others, and being a voice for the voiceless. Many couldn’t and many shouldn’t, but we must not forget. It changes you, the experience of walking where so much evil trod, so little thought for any human before them. Our world needs to be very aware of how that began. I hit like, although I hesitated to, but had to because of the depth, meaning and well written reminder. You read and shared thank you. Your input is received gratefully. A moving poem and one that should be read so we never forget. It could so easily happen again. I sincerely hope not. Thank you for taking time and for the commenr. Beautifully written, Ellen, if such a word can be used for so sad a piece. I believe it’s our duty to continue to lament man’s inhumanity toward man with these reminders. Otherwise, sadly. we are not above committing them again. If my piece moves just one person enough to think about today, I will have succeeded. Sometimes we just have to. Even after 75 years it’s still too distressing to think about. I almost didn’t read. Then I knew I had to. In memorial, we must never forget. Thank you for doing so. In these uneasy times the fear is repetition. A terrifying thought. Agree! That thought horrifies me. Which is why I knew I had to read. Not only never forget. Never again! I knew Holocaust survivors when I was a kid, too young to really understand what they had gone through. It was a horrific period of history, one that I fear would be too easy to repeat. I agree with you in wishing heads of state (and others) would see what you saw. Well said. Thank you for reading and commenting. It means an awful lot. such horribly unbelievable cruelty. Very difficult to imagine that fellow humans can and have done such atrocities to one another. We can’t knowingly allow this to ever happen again. I was asked “if you were ordered to would you” before i could spit out ‘never’ she said “on fear of condemning your family, your friends and acquaintances to torture and death”. Ellen, you expressed your feeling with such clarity and beauty. It is so very difficult to wrap your head around the murder and torture that was the Nazi regime and to believe that we humans are capable of being the murderers or being the humans who ignored what was happening. If you want to life your spirits, read the Zookeeper’s Wife. It is the true story of a woman and her husband in Warsaw who helped many people. Thanks Bernadette I will do that, Loving books as I do it won’t be hard, but the film comes out this month 31st March in USA. I have studied, read and watched so much in the past that I thought I was prepared; and I would be going to pay my respects. I wasn’t prepared for learning more and I will never forget. I will probably go see the movie but the book is very special. The author uses her own words and there are some personal photographs. I hope the movie moves people in the USA to think about what our government is doing and perhaps realize the importance of protecting all people. Ours too 😢 lest we forget Betnadette lest we forget. You did a great job writing about this. The most emotional I ever got was visiting Dachau-horrific. I love the rose, too. It was tough I am glad that I went and pleased that you visited and read my work. The place without a doubt altered the me I was. I love the tribute of a single rose on that bed where so much pain and sorrow must have lain. I can only imagine how moving it would have been to visit in person. We must never let this happen again. That is why I wanted to write this. I wish every head of state was made to go. A compulsary visit to at least one site. It would be a sobering experience for them that’s for sure. I ticked like because I support what you say. Those dark times are always just a heart beat away. Oppressors are always around as are the oppressed. Lest we forget! Kracow is a beautiful city. It goes to show evil can happen anywhere. Thanks for reading Willow. Heartfelt from someone who has seen and felt the present evil of the perpetrators and the terror of the victims. Thank you for reading this and for experiencing it with me.